At Southern California Ford Dealers, we work hard to represent all 69 individual Ford dealers in our group. One of the biggest benefits of such a large organization is being able to share the amazing Ford service and parts specials in Southern California. While all of our services are excellently priced, Southern California Ford Dealers makes an effort to offer our loyal customers some seasonal Ford service specials that will make owning a Ford SUV, sedan, and truck even easier. Let's take a peek at what specials are currently on offer from Ford dealerships around Southern California. On average, most tires need to be replaced every 25,000 and 50,000 miles. Of course, this number can change due to driving habits and road conditions. Either way, we all want access to the best tires at the most reasonable prices. Right now, Southern California Ford Dealers have a handful of current and ongoing tire specials. Low Price Tire Guarantee: All Ford Dealers offer this guarantee which covers 13 major brands and comes with a 30-day price guarantee. You must have the tires dealer-installed and it covers retail purchases only. If you purchased tires from Ford from 9/01-9/30, you can get a $50 rebate by mail when you use your Ford Service credit card to make a qualifying purchase of $250 or more (before tax). This offer is subject to credit approval and must be submitted by 10/31/18 by mail-in rebate form or online at fordowner.com. There is a limit one $50 mail-in rebate per visit. Since engine and transmission problems can be expensive, Southern California Ford Dealers works hard to keep costs low. Our participating dealerships do this by offering a $50 rebate by mail when you use your Ford Service Credit Card to make a qualifying purchase of $250 or more. This offer also works any of our services, but it is a great way to save on engine and transmission repairs! 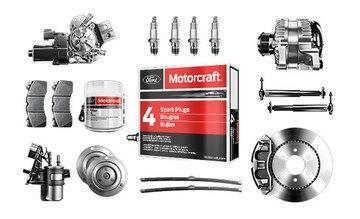 You can get up to a $60 rebate by mail on a Motorcraft Complete Brake Service when you use the Ford Service Credit Card. 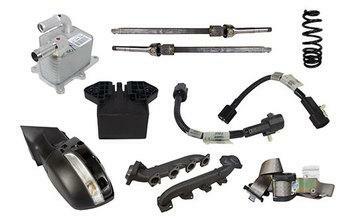 Motorcraft brake pads installed for $99.95 or less. This is a per-axle price on pads or shoes on most vehicles. If you purchased brakes on or after July 1, 2014, installed by Ford Dealership or Quick Lane technician you are eligible for our Lifetime Brake Pad Guarantee. This nontransferable offer does not include labor costs not included. To learn more about these Ford service and parts specials, it's important to visit our Southern California Ford Dealers website often! While you're here, make sure to check out our entire vehicle lineup and latest offers, including our Military Appreciation Program and Ford First Responder Appreciation Program.